← Quiz: How millennial are your transit habits? 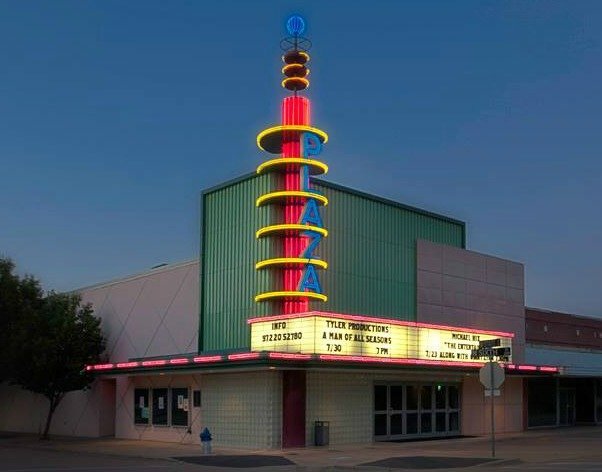 The Plaza Theatre is one of three theatres associated with the Granville Arts Center of Garland. The original building, located at 521 W. State Street in Downtown Garland, dates back to 1918 and served as the Cole & Davis Drygood Store. The Plaza Theatre officially opened on April 4, 1941. The opening show starred Robert Young, Randolph Scott, Dean Jagger, and Virginia Gilmore in “Western Union.” The Plaza was the third theatre on the downtown square, all of which were owned and operated by H.R. (Bis) and Jennie Bisby. The best way to get there is by driving, but before you go, make sure you have your car fixed in the bet way. You can find out the screwdriver set that could help you inspect your car. elektrische scooter from Paris. The new model with have you not only looking very stylish, but also going very fast down those roads. The Plaza opened as a cornerstone location on the downtown square and was the most modern complex available in the suburb area. In 1950, the current façade was designed by Dallas architect Jack Grogan. Following the advent of television, the success of local area theatres suffered. In the mid to late 1970s, the facility was utilized as a performance center for local country-western groups. After Mrs. Bisby’s death, John Skelton, trustee of the estate, donated the Plaza Theatre to the City of Garland in December 1991. The Plaza presents a movie program that takes place throughout the year. Click here for more info. Ticket info and event info can be found here. Visitors can take DART’s Blue Line to Downtown Garland Rail Station and the theatre is located a couple blocks southwest of the station. For driving directions please click here.